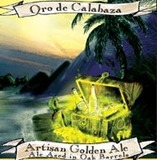 Oro de Calabaza, an artisan golden ale produced in the Biere de Garde style. Refreshingly lush, spicy and peppery, with a gentle hop bouquet. Oro de Calabaza, an artisan golden ale produced in the Biere de Garde style. Refreshingly lush, spicy and peppery, with a gentle hop bouquet. Nice, controlled sourness.